1 of 8 Heat oven to 350 degrees F. Coat inside of 1-1/2-quart souffle dish with nonstick cooking spray. 2 of 8 Separate eggs; place yolks in small bowl, whites in large bowl along with the 3 additional whites. 3 of 8 Combine cocoa powder, sugar, flour and salt in medium-size saucepan. Gradually whisk in milk until well blended. Cook over medium heat, whisking, until mixture thickens and boils, 10 to 12 minutes. Remove from heat. Add vanilla. Whisk a little hot chocolate mixture into yolks; whisk yolk mixture into chocolate in saucepan. Stir in chips until melted. 4 of 8 Beat together egg whites and cream of tartar at high speed until stiff, but not dry, peaks form. 5 of 8 Gently but thoroughly fold chocolate-yolk mixture into whites. Pour into prepared dish. 6 of 8 Bake in 350 degrees F oven for 35 minutes or until souffle is puffy and shakes slightly when jiggled. 7 of 8 While souffle is baking, press raspberries and syrup through fine sieve over bowl to remove seeds; you should have 1/2 cup sauce. 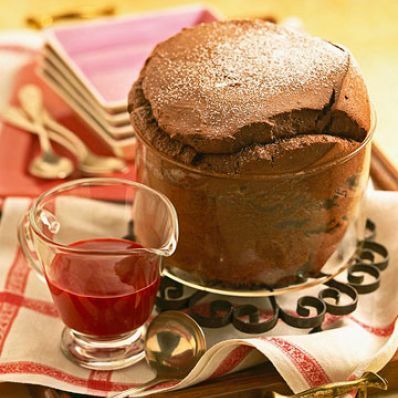 8 of 8 Serve souffle immediately with raspberry sauce. Garnish with fresh raspberries, if desired. Per Serving: 3 g fiber, 179 mg sodium, 3 g sat. fat, 107 mg chol., 9 g pro., 173 kcal cal., 6 g Fat, total, 26 g carb.